Small, versatile text editor. Lots of features. o Insert, delete, split, join a line. a marked block of partial or whole lines. o Print a file/block to LPT1-LPT3. o Enter any ASCII code. o Temporary return to DOS. o Set left/right margins and page length. o Format (justify) a paragraph. E-mail and simulate a "smart" typewriter. size can be changed with utility program TEMOD.EXE. o F1-Help. Where to find a pop-up screen of all TE commands. o Line and column position of the cursor. to toggle between Insert and Ovrwrite. additional prompts required by some commands. can't be found, TE asks "(file name) not found. New file (Y/N)?". name. If N, TE will terminate. available. Each command provides prompts for various options. TE can continue to be used with the current file. the new file name and terminate. file. Quit (Y/N)?" appears, it could mean the file is read-only. read-only attribute is removed with the DOS ATTRIB command. (ASCII 13,10) characters are inserted. 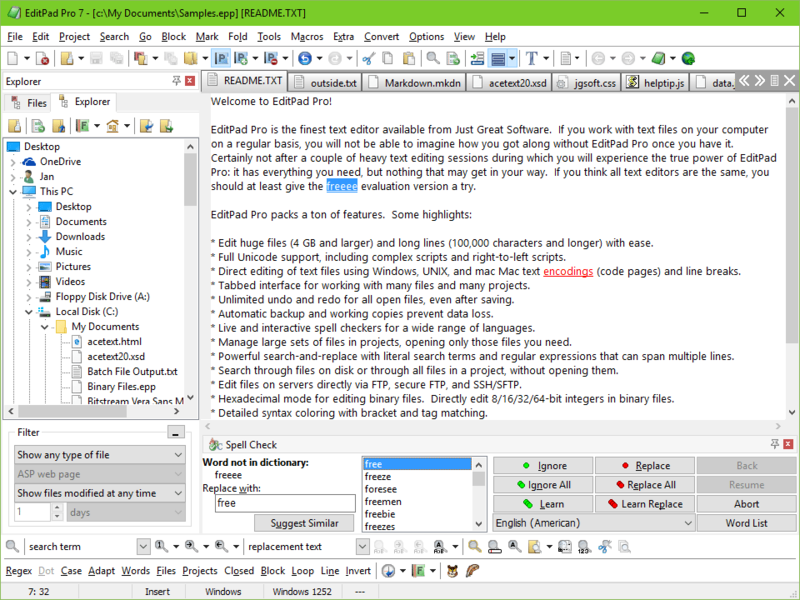 the file contains tab characters, they will be displayed as an "o"
5 lines, the default mark is line 1. Insert/delete commands always operate on the line with the cursor. Toggle between character Insert and Ovrwrite (Replace) modes. Refer to the explanation in the Status Line section. added after the last line. positioned to the left margin of the next line. left margin of the next line. Delete the character to the left of the cursor. line is made blank and not deleted. indent and unindent one or more partial/whole lines. copied, moved, deleted, written, or printed. line will be deleted if the start column is at the left margin. the command will be canceled. column 1. The block end column is ignored. command can't be issued in the middle of another command. answer Y. Otherwise, answer N to cancel the print operation. keypad. The equivalent symbol will be displayed on the screen. When prompted with "Find:", enter a phrase of 1 to 31 characters. Enter key only. TE asks for answers to the following options. start column, line of the marked block. sensitivity will be ignored. For example, the phrase "the"
will find "The" and "the" if N.
is reached. If N, the operation will be terminated. find phrase will not be replaced. o TE asks "Repeat (Y/N)?". If Y, the search will continue. If N, the find and replace operation will be terminated. all data changes made to the file since it was last saved. TE prompts for answers to Left Margin, Right Margin, Page Length. Column 1/252, Page Length - 62 lines. command is ignored if the right margin is the default value 252. For example, the following paragraph will be processed as shown. come to the party. The time is now. the party. The time is now. specified mark n = 0-3.
block column instead of column 1. (c-KS), F5 - Print file or block (c-KP), F9 - Delete line (c-N).